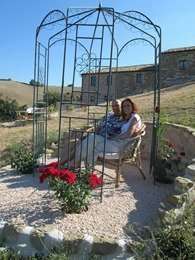 In the middle of Italy, in the hills of Le Marche, is Agriturismo Carincone. In our restored farmhouse dating from 1670, you will find five holiday apartments. Each apartment is decorated according to a different theme: Air, Water, Fire, Earth and Sun & Moon. You are in the province of Pesaro-Urbino and close to the picturesque village of Pergola. From your apartment you have a wide view over the countryside. Here you can enjoy peace and space, like the real “La Dolce Vita”. Check Carincone in pictures! Each apartment has a private terrace. There is also a large sunbathing lawn with several seating areas, sun loungers and a swimming pool. There are many possibilities for excursions in the area: culture, nature, hiking and cycling, but also fun, good food and wine tasting. We are looking forward to welcoming you in one of our apartments in our lovely Agriturismo Carincone and introduce you to our warm Italian hospitality! We are Eric and Nanja Helmers, both of us born in Amsterdam, and we have lived there for many years in a rebuilt luxury motor cargo ship (1913) in the Amstel facing the Stopera, until in 2006 we decided to start a whole new adventure and emigrate to Italy. We really changed our course and started a new adventure in the beautiful hills of Le Marche. After a visit to Le Marche we found our dream . . . at a perfect location: an old farmhouse, restored on the outside, which could be transformed to our own taste. This was the starting point for an immense challenge: to put our Agriturismo Carincone on the map! It was a huge job, but we succeeded and we have been in full operation for years now. Now available: our own dried lavender, in a scent pouch. 100% natural and organic. Nanja has been mainly responsible for the design and decoration of the apartments in Carincone. But she also makes paintings and portraits. A new website about the art of Carincone is now online. You can enjoy Nanja’s work on NH-Art.